Website mainenance, Social Media management, Writing for Press and Design for Print. Website Maintenance, Social Media Management, Writing for Press and Design for Print. SoJo worked closely with Malvern Cube managing their whole online portfolio from Feb 2015-Feb2017. We carried out a website design project to create an easy to manage WordPress site – with integrated booking system, calendar and ticketing pages. Their facebook and twitter accounts were also maintained by us. Both accounts have seen a significant rise in followers since we took over maintenance in February 2015 with their Facebook page rising from 500 to almost 900 likes. We regularly posted about upcoming events and gigs at the centre which has seen an increase in ticket sales with the over 50% of people stating when purchasing tickets they heard about the event or gig on Facebook. 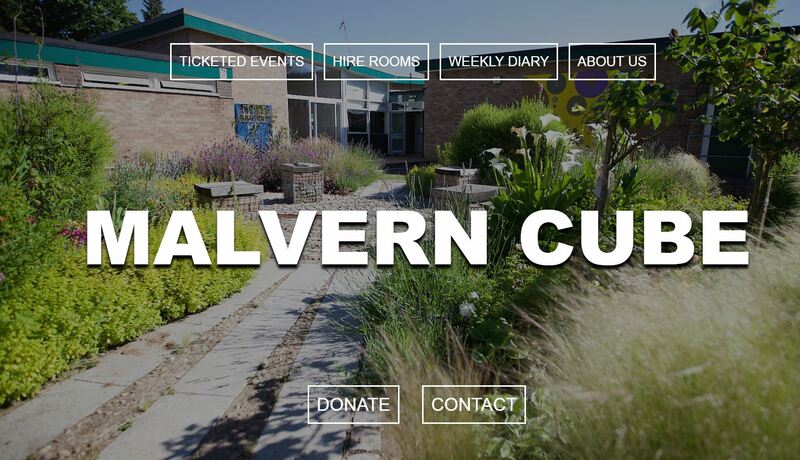 Malvern Cube regularly host live music, theatre, film and comedy events which require advertising in local press. We wrote their press releases for each event and send them to our local press contacts regularly securing article space in local papers. We also secured Malvern Cube regular editorial space in local event magazine SLAP so wrote an article a month promoting their events. We still regularly complete print design work for Malvern Cube creating posters for their film club, comedy nights and designing adverts for the local press as well as designing a quarterly programme leaflet.